The secret for maximum muscle building. You train hard. The results? Not as good as they should be. The problem: Your training. And your diet. Because that is more important than you might think. A pack that will stand by your muscles in all aspects of your life. That helps you to take your workouts to the next level. So that you can finally get the most out of your body. Unsatisfactory results despite training really hard? No time for “eating right”? Developed by real athletes. For real results. "A perfect workout plan is not everything. The right diet is just as important to ensure you see results. This is where this pack comes in. And it works." "I often don’t have the time or the will to eat. That is why we developed our Instant Oats for this pack, which is basically liquid food. The best workout won’t bring the results you want if you don’t consume enough calories." "Aminos is the magic word. Simply because they help you to really concentrate during a workout and push through, all the way to the final repetition. They also boost your energy levels after your workout. And that is what really matters." This pack has everything you need to boost your power. Your problem: Muscles are built using protein. Too little protein, too little muscles. What happens: You eat. You train. Bigger muscles? Nope. Your solution: 30 g of whey protein after your workout. It really boosts protein absorption in the body. Your problem: You run out of steam in the middle of your workout. Both mentally and physically. What happens: You lose focus, which decreases your ability to perform at your best, resulting in your training not achieving the desired effect. Your solution: Energy Aminos support focus and motivation. Helping you to get your head back in the game. Not in the mood to work out? No longer an issue. Your problem: You feel completely finished after a workout. Your muscles won’t stop burning. What happens: Your energy levels have dropped to zero. Your muscles are trying to recover but they have nothing to help them. Your solution: Recovery Aminos give your muscles the glutamine, BCAAs and quickly accessible carbs they need after your workout. You will actually look forward to the next session! Your problem: When it comes down to it, you just can’t manage that final repetition. What happens: Your training stimulus is too low and no extra muscle gets built. Your solution: Creatine. Creatine improves your rapid and maximum power training and helps you overcome training plateaus. Your problem: You train intensively. But you don’t have the time to eat properly. What happens: Your body wants to build muscle, but doesn’t have enough energy. The solution: Instant Oats can easily be dissolved in liquid for a power drink. A great way to ingest 380 calories without even noticing. 1. Pour the liquid into the shaker. Add 30 g of Whey Protein and 100 g of oats. Muscles need calories. More muscles need more calories. It is not always easy to reach the calorie surplus you need. That is why we have developed Instant Oats for our Muscle Building Pack PRO. It is pure, organic oatmeal that you can dissolve in your Whey Shake, yoghurt or juice. Basically liquid calories. The perfect nourishment for your muscles. No artificial additives or chemicals. *Calorific value for 300 ml water, 30 g Whey Protein Vanilla flavour & 100 g Instant Oats. Training + Recovery + Diet = Success. Training. Recovery. Diet. Those are the 3 pillars on which success is built. The most important one? Diet. Your diet gives you the energy to go one step further in your workouts. And after your workout, it also supports recovery. What about in between? They give your muscles the energy they need to grow. You want to know exactly how it works? Or how you can coordinate the effects of your workout and diet? Our athletes and food scientists will be happy to advise you. Specifically for you and absolutely free of charge. Creatine made of the purest Creapure®. Calories from European organic oats. Dietary supplement. Amino acid mixture with lemon flavour. With sweetener. Contains caffeine and guarana extract (200 mg caffeine per portion). Not recommended for kids and pregnant women. Dietary supplement. Amino acid blend with pomegranate flavour. With sugar (maltodextrin, dextrose) and sweetener. May contain traces of other grains that contain gluten. 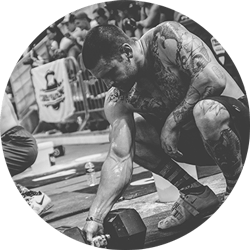 Dietary supplements for intense muscular effort, specifically suited to athletes’ needs. 1 These values are based on preparation with water. A varied and balanced diet and a healthy lifestyle are essential. Only suitable for adults who engage in intense physical activity. Positive effects can be observed from a daily intake of 3 g of creatine over an extended period of time. Creatine increases the body’s performance in explosive power training as part of short, intense physical activity. May contain traces of crustaceans, milk (incl. lactose), soy and gluten. The basics you need to know about. You want to build muscle? Then there are 4 very important things to have: the right mindset, a daily calorie surplus, the right training stimulus and plenty of protein. Muscle building is a mentality. Distractions are poisonous for your mental focus. That means: concentrate on individual aspects like clean movements or conscious inhaling and exhaling. "Calorie surplus" means nothing more than consuming 300-500 more calories than you would burn on a daily basis. To put it simply: your body uses these "surplus" calories to build muscles. If you don’t have those surplus calories, then your body has nothing to build muscle with. You need to give your body the right training stimulus to ensure it uses the calories to build muscle instead of fat deposits. That means, that you have to put enough strain on your muscles during a workout to push them to their limits. The muscle remembers this strain and builds up more substance whilst simultaneously recovering – that means it grows – so that it can handle this kind of strain better next time. If you always do the same workout or work with the same weights, your muscles have no reason to improve and will just remain at the status quo. Protein consists of various amino acids and is the building block with which all muscles are built. In addition to a calorie surplus, it is therefore also important that enough of the calories you eat come from protein. That is why you should eat 1.3 - 1.5 g of protein per kg of your body weight a day during muscle building phases. Your muscle routine. Explained in simple terms. Easier than ever before. You need some pointers for your personal training and diet plan? Have a look at our Coach section. How do the ingredients of the Muscle Building Pack PRO work together? The ingredients of our Muscle Building Pack PRO are put together by athletes and nutritionists to perfectly complement each other. Creatine, Whey Protein and Instant Oats support you on training days as well as the days when you aren’t working out. 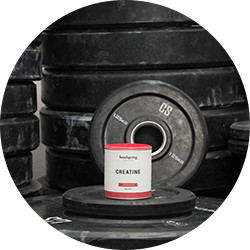 3-5 g of Creatine daily will improve your performance during explosive power training and supports muscle building. Whey Protein promotes muscle building approx. 45 minutes after your workout and covers your recommended daily protein intake. 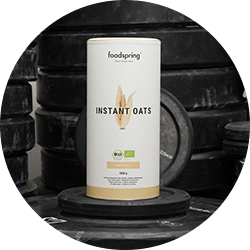 You can easily reach the required calorie excess needed for muscle building with our Instant Oats. You can drink them in combination with whey as a shake, dilute them in other drinks or simply mix them into yoghurt or muesli. You should support your muscle building even more on your workout days with creatine, oats and whey. Our Energy and Recovery Aminos offer the perfect support for your workout. Energy Aminos give you the energy and focus you need to reach and exceed your limits. 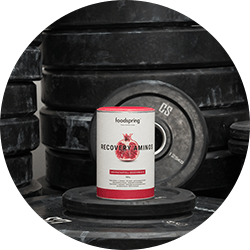 foodspring Recovery Aminos give your muscles back everything they need after your workout to make sure you are fit and ready for the next session. Which is better for me: The Muscle Building Pack Basic or the Muscle Building Pack PRO? Our Muscle Building Pack Basic is perfect for when you are starting out with weight training or working your way up to heavier weights and want to get further faster. The Muscle Building Pack Basic also helps you along when you just want to look good. 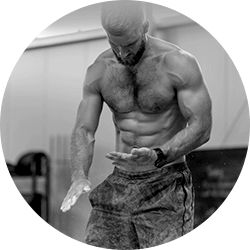 You are already experienced or work out 3-4 times a week or more and would like to finally get further with it? You want to leave “average” behind and become truly athletic? Then our Muscle Building Pack PRO is just the thing for you. Why is whey on its own sometimes not enough? 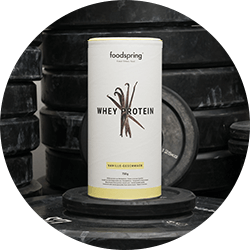 Whey Protein is the perfect protein to support muscle building after your workout. Or to give you an extra protein kick between meals. But your muscles don’t always need the same thing. Taken before exercise, aminos like L-citrulline, L-leucine and Beta alanine help you to get pumped up for your workout and really wake up your muscles. Glutamine and dextrose also make sense before a really intense workout and before you have your whey. Yes, Whey Protein is the foundation for muscle building. But you need more to go that extra mile! Aside from that: Just taking protein all day is no fun anyway. How, and for how long should I use the Muscle Building Pack PRO? 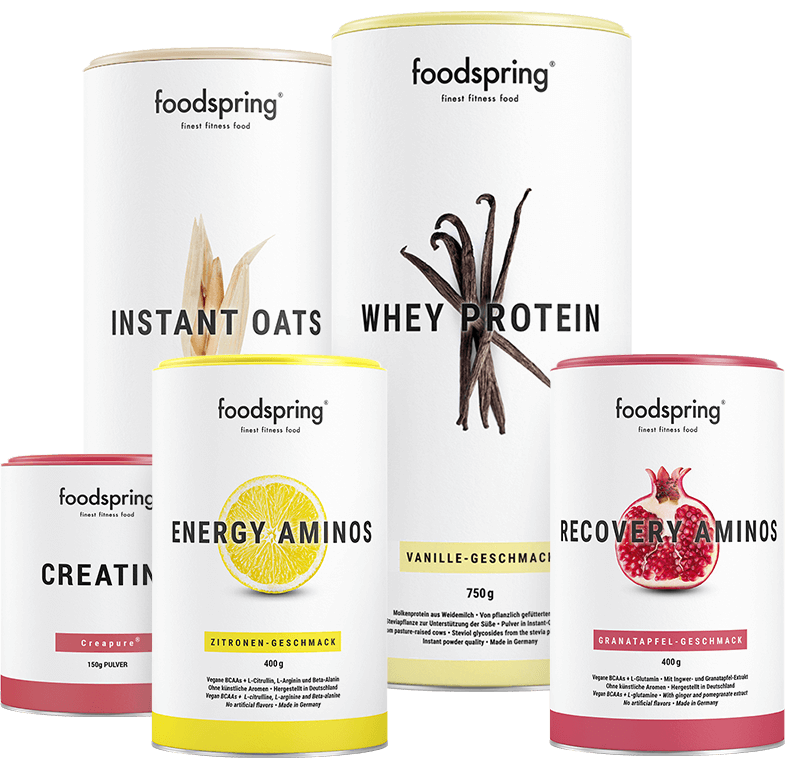 The foodspring Muscle Building Pack PRO can be used for as long as you want. It is, however, important to always take note of the recommended consumption amounts for each product and the recommended dosage. Extra Tip for Creatine: Creatine treatments are a thing of the past. According to recent studies, you should be taking 3-5 g of Creatine over a minimum of 6 months to feel and profit from the maximum benefits. Important: Drink a minimum of 2-3 litres of water daily. For each hour of exercise, add one litre to that. Don’t use Creatine before consulting your doctor if you suffer from kidney problems. How does a better diet help me train better? As a basic rule, make sure to regularly and incrementally increase the weights you use and vary your workout plan, as well as the exercises you do to consistently improve. We cannot say for certain what your perfect workout should look like. That all comes down to a variety of factors, like your experience, your current fitness level and your goals. But it also matters how much time you have for working out and your overall health. You can find a range of information about muscles and mass building in our Coach Area. 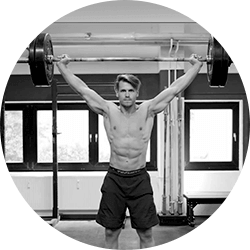 There you will find tips on how to create your own workout plan, choose one of our ready-made workout plans, and plenty of methodical knowledge about the subject of training. If you would prefer some personal advice, then please contact our customer service. Is the Muscle Building Pack PRO good for any type of sport? Yes. Alright, maybe it would be a bit much if you do yoga. But it is definitely a good idea if you do weight training, functional training or ultra-marathons. In other words: whenever you push your body to its limits, that is when you need to support it the most. Only then can you make significant and lasting progress. Every type of sport poses different demands on your body. Endurance training requires more carbs and less protein than weight training. These are points you have to clarify for yourself. If you need help, then just contact one of our free advice lines by phone: +43 720 230251, email or Facebook Messenger and speak to our diet and fitness experts. Contact details? You will find those at the bottom of our website. Muscle Building Pack PRO will be back in stock shortly.